Martin Luther King, Jr.’s last speech “I’ve Been to the Mountaintop”, was delivered April 3rd 1968 at Mason Temple in Memphis, Tennessee. He was assassinated the next evening on April 4, 1968, at the infamous Lorraine Motel, which has now been converted into the National Civil Rights Museum. Let’s take some time today to reflect on his words and his message. 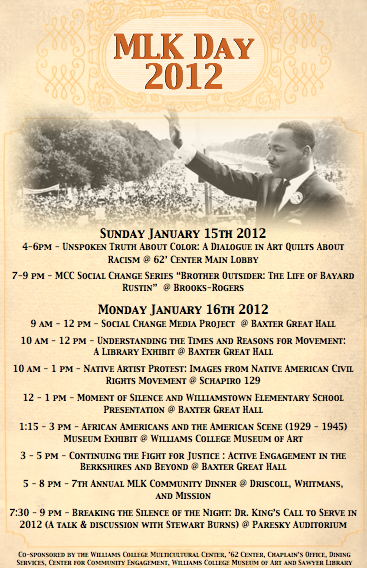 The MCC has created a great lineup of workshops, exhibits, and discussions for this year’s Martin Luther King, Jr. Day tomorrow. However, Williams College has decided not to cancel classes. After doing a little research, I was surprised to find out that it wasn’t until January 17, 2000 that MLK day was officially observed in all 50 states. Furthermore, Greenville County, South Carolina was the last state county to officially make Martin Luther King, Jr. Day a paid holiday on January 16, 2006. Some states don’t even call Martin Luther King, Jr. Day by it’s name. For example, in Utah its called Human Rights Day and in Arizona and New Hampshire its known as Civil Rights Day. While I’m definitely thankful and excited for all the campus events, I just wish we would recognize the significance of the day wholeheartedly. Winter Study is not so serious that we couldn’t afford to miss one day of classes. Regardless, it is important that students show support by attending events even if Williams won’t officially honor the holiday.